The underlying structure of the DETEXI NVR software consists of many individual services, which allow execute and organize all the tasks it is responsible for. 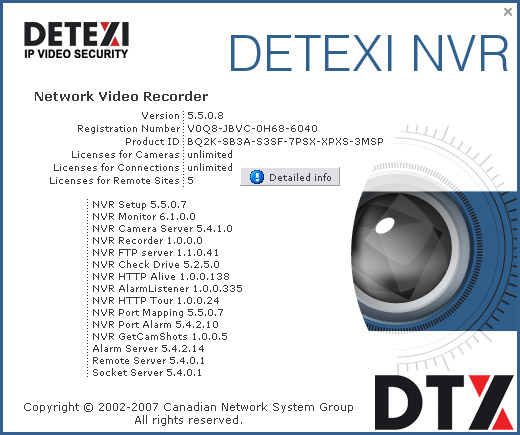 All dialogs that allow control and configuration of all aspects of the DETEXI NVR are found under the NVR Control Center — the DETEXI NVR graphic interface that servs as a communication tool between the DETEXI NVR and system administrator. Open DETEXI NVR Control Center from Start — All Programs or click the program icon on your desktop. The Monitor service is an internal service to start/stop other DETEXI NVR services. The Monitor service is started and stopped using the Start/Stop NVR Service toggle button in the NVR Control Center — General — Global Settings. If a company uses Web-Proxy Server that requires authentication to get to the Internet, proxy setting must be done. Get Current button helps to get the information about current domain, computer and user names. 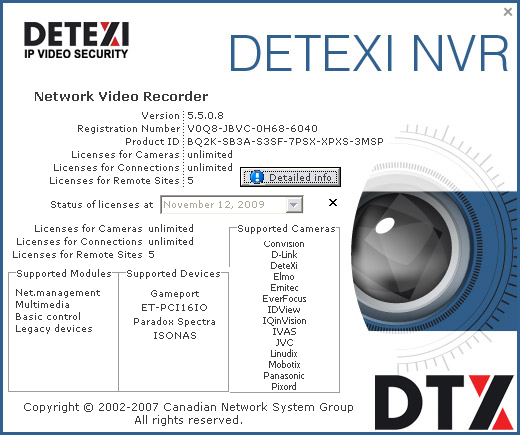 Configurable Encoder is available in the DETEXI NVR 5.5. When enabled, compression in the NVR involves finding the difference between two images in the video stream and then applying a compression algorithm. In the upcoming DETEXI NVR 5.6 release for optimized quality and bandwidth MPEG-4 and highly efficient H.264 video compression will be supported. To learn more read the Compression section. One of the methods to deal with IP-devices errors is to setup a Recovery Procedure inside a camera recording schedule. This procedure fully describes how the Recorder will manage the faulty camera. To learn more read the Reliability System — Setup Health Monitoring section. Codec selected from the Current Video Codec list is used as a default by internal automated conversion procedure in order to create an alarm video AVI file on the client request. Still another codec could be selected directly in the DETEXI Client. Select your preferred language. English is recommended. Dutch and Swedish now under construction. In the NVR Control Center — General — Advanced click About button — the DETEXI NVR About splash screen appears. To get more detailed information click the Detailed Info button on the splash screen. Detailed information includes Supported Modules, Supported Devices and Supported Cameras lists. All DETEXI NVR services are visible and configurable in the NVR Control Center — Monitor. The status of all the cameras that have been installed can be seen there as well. Click on any service name to turn it red to stop the service or blue — to run. The Monitor service is an internal service to start/stop other DETEXI NVR services. It is also responsible for monitoring the health and status of all NVR Services. Checked services will also be started/stopped along with the Monitor service. For most system settings, the NVR services support runtime configuration . This means that changes can be made to cameras, users, etc. without stopping the NVR Services. When you are ready for your changes to take effect, you should synchronize the services with the current configuration. The Synchronize button is found in the upper right-hand corner of the NVR Control Center, no matter what page is active. 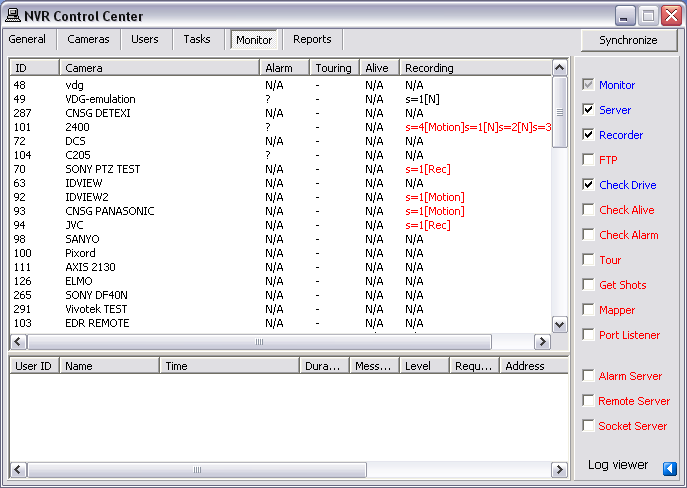 To view log messages that the system components write to a common log file click Log viewer at the bottom right corner. The unnecessary services can be turned off to preserve system resources. It is recommended that the Monitor service be active at all times. Checked services (with checked checkbox next to the service name) will be monitored and started/stopped along with the Monitor service. In the NVR Control Center — Monitor uncheck all services except Server, Recorder and Check Drive to enable their monitoring. Click on the service names to turn the Server, Recorder and Check Drive names blue and all others — red. This turns off the unnecessary services while keeps running the authentication and recording services. DETEXI IP-Surveillance reliability checking is based on the Task Execution Engine. If something happens to the system, hardware or one of the NVR services, certain task assigned to this event is executed. The obvious conclusion is — you will never have any task executed at all and you will never know that something is wrong with the system. To solve this issue a special NVR Status Task was developed which (if assigned) is executed once a day at a time you can predefine by yourself. If this task HAS NOT BEEN executed at that time it means you have to check the system. The purpose of the NVR Status task is to send out the current status of the NVR services at predefined time. It is initiated once a day at a predefined time and provides the user a list of the NVR services being monitored and their status. Select an appropriate predefined task from the NVR status task drop-down list. If you want to setup your own schedule with a different time interval (twice a day or once a week or whatever you want) to send out notification that the NVR is alive, you should create a Scheduled Task and use it for checking if the Reliability System is functioning properly.